The Carnegie Library building was one of more than 2,500 libraries worldwide funded by US steel magnate and philanthropist Andrew Carnegie in the early 20th century. 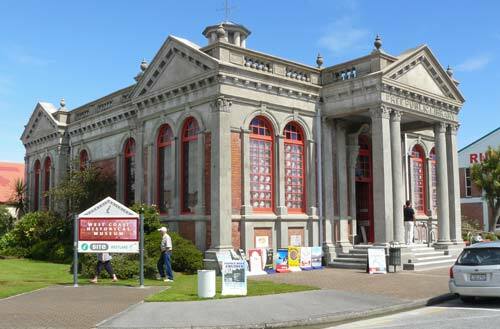 Completed and opened in June 1908, it is one of 18 Carnegie libraries in New Zealand. The entrance steps were a typical feature of the libraries, signifying that learning elevates a person. By the late 20th century the building was no longer used as a library. It was subsequently restored and strengthened, and formed part of the West Coast Historical Museum. This is a beautiful Historic Building with a wonderful story. The Museum inside is a fascinting insight into hardships and triumphs of New Zealands Gold Rush Era on our Gold Coast from Greymouth to Hokitika. The West Coast Cycle trail goes right past it so do stop in.